Last week, in the darkness of the Harold Pinter Theatre, I watched as Andrew Scott took to the stage as Hamlet and in doing so captivated an entire audience. Instead of choosing to play the well-known character in a traditional manner, Scott enticed the audience by focusing on mental health issues and played Hamlet as a slightly unhinged character whose unpredictability was key through the modernised production. The result was spectacular. Mental health has always been present in Hamlet, what with the apparition of ghosts and voices in one’s head, but traditionally Hamlet is played as a hero, set to bring justice to Denmark. Scott, however, takes it to an entirely new level by making mental health the focal point of his performance and in doing so makes you pay attention to the other side of Hamlet’s character – the dark and destructive side. It’s an interesting take on the classic tragedy, but it’s incredibly relevant in today’s world. Scott brings to light issues surrounding mental health throughout his character’s development. He is nothing if not incredibly talented at emotions, and throughout the play, he maintains slightly unstable characteristics whilst going through the emotions of love, hate, fear, distaste, anger and grief. Different to other performances of Hamlet, the end is not climactic but comes across as almost accidental, once again ensuring the audience is aware of his focus on mental health. 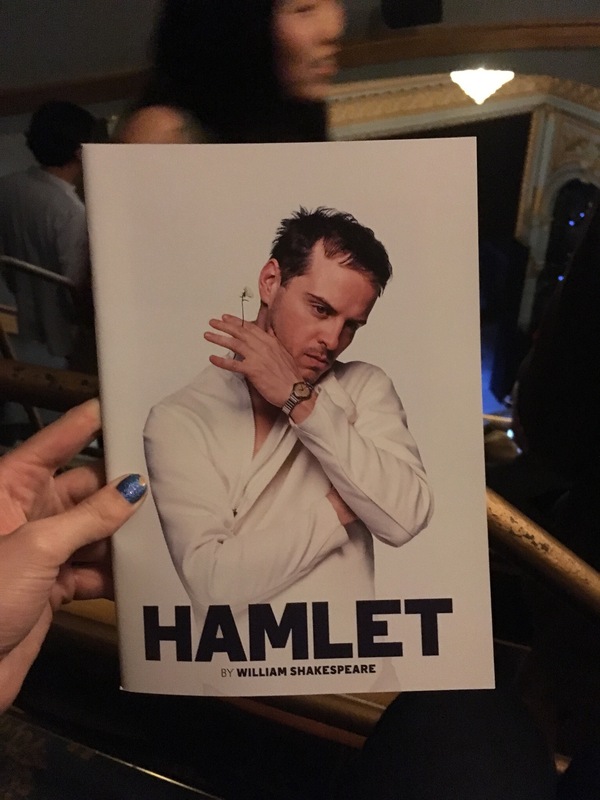 Andrew Scott meticulously transforms Hamlet from a character hell bent on getting revenge for his father, to a vulnerable, grief-stricken young man who is desperately trying to be understood. Mental health and especially mental health in young men is particularly relevant at the moment. There have been countless campaigns over the past few months drawing attention to the mental strains that young men feel, from the way they look to being in touch with their emotions. Suicide is still one of the largest killers of young men in Britain and whilst there are fantastic groups trying to tackle the problem, a lot still needs to be done on a social level. Scott, who is arguably best known for playing Moriarty opposite Benedict Cumberbatch in the BBC adaptation of Sherlock, shot to fame by his ability to play a character which embodies something different; characters who are socially “unacceptable”. His performance as Hamlet is no different, and there was more than once occasion where he made the audience gasp, jump and shudder as one. Whilst the entire cast was fantastic, the atmosphere changed every time Scott took to the stage. I’ve always been a fan of Shakespearean productions which stray a little from the original transcripts. In my opinion, interpretations are what plays are all about and Andrew Scott’s interpretation of Shakespeare’s Hamlet is both relevant and captivating. If you can get tickets to see it before it closes – do it!